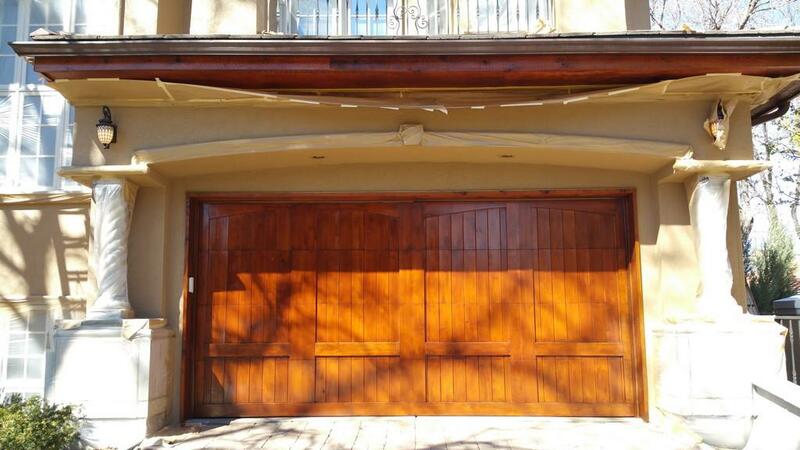 Assessment: David contacted LIME after receiving a personal handwritten note on his door that educated and explained how and why the garage doors were weathering and that he should #GETLIMED! During our initial estimate, we discovered a lot of weathering on all of the garage door ledges where water and snow had rested over the past winters. 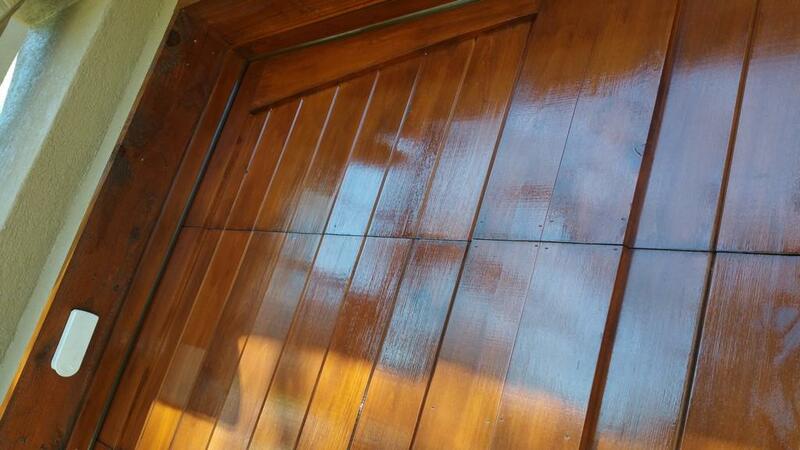 The moisture had penetrated the wood and caused it to fade. That, along with direct sunlight flooding the door for part of the day, added to the distressed elements on the lower portion. To restore a similar color throughout would be challenging, but LIME was willing to take on the task because it was right up our alley! 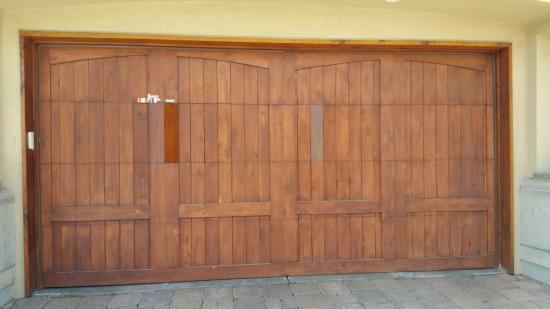 Advice: First, LIME power washed the door thoroughly to remove dirt and excess flaking. 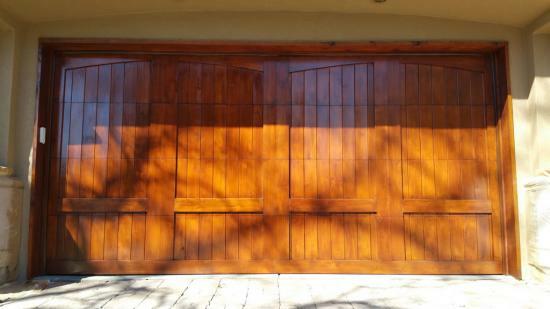 Next, our craftsmen power sanded the entire surface of the garage doors deep enough to remove excess stain and to remove water and mildew stains. This tedious process took at least two days with multiple people and multiple audits by Ernesto our PC to approve before moving to the next step. Next, we dusted off the surface, then masked and taped off areas around the garage exterior thoroughly. We chose a very high-end oil-based Sikkens RSD stain that would penetrate the distressed and porous wood. We applied one thick coat, but then found that it was so dry that it would require another. 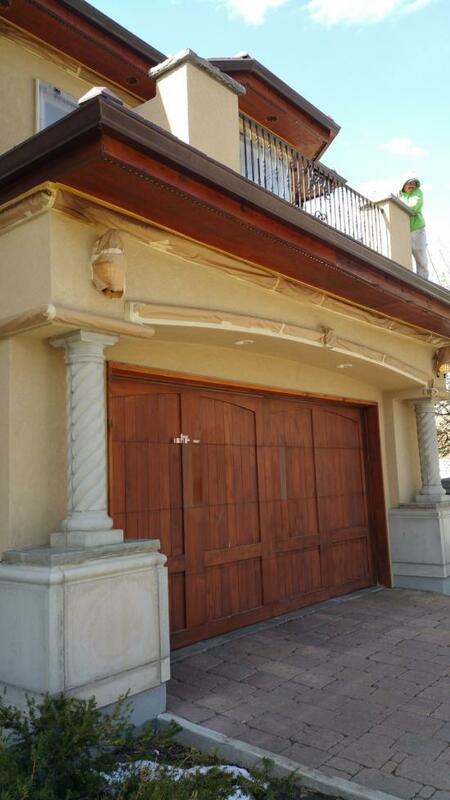 After the next audit we noticed we could fix the lower half if the owner added two additional coats on just the lower portion ledges of the weathered garage door. The final look was made complete with a thick clear topcoat and the owner was ecstatic with the transformation and result. Note: We also did the same process to his double entry doors and all of the soffits on the home with outstanding results! The lovely Hilltop neighborhood gets its name from the fact that it is higher in elevation than the surrounding parts of the city. It is located in the heart of Denver with around 66,000 people and is home to dozens and dozens of highly satisfied LIME Painting clients. Hilltop is quick to refer us to friends, family, and neighbors. And for that we are grateful!